Make cooking super simple in this Super Simple Recipes series. Each book features a different delicious main ingredient kids will love. With step-by-step instructions on how to make the easy and tasty recipes, young cooks will jump at the chance to prepare their favorite food in new ways. 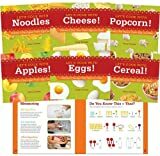 Includes measuring guides and tools and ingredients lists to help enhance early learning. Super SandCastle is an imprint of ABDO Publishing Company.